The picture below is hard to look at but it also very difficult to ignore. 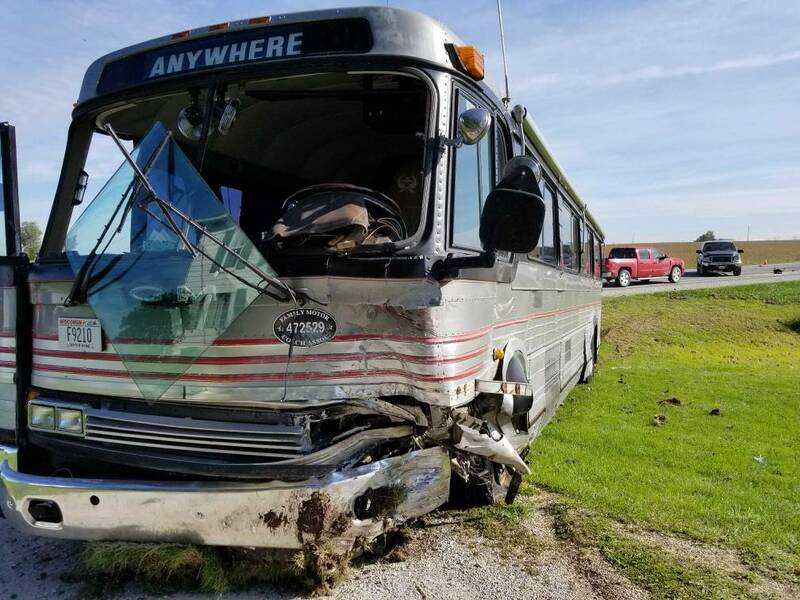 This is a 1964 GM 4106 bus/motor home that was on a two lane road when it was hit by a small car that crossed the center line. The bus was moving at 53 MPH. The driver in the car was tragically killed. Although the bus was totaled, the man and the woman in the bus walked away without major injuries. The bus lost its steering and braking capabilities and ran off the road but it remained upright. It was a terrible accident but it could have been much worse for the bus owners and other innocent bystanders. The bus handled the impact remarkably well. It could have easily flipped or hit other traffic or buildings after the initial crash. If it had been a normal RV it probably would have come apart when the car hit and there most likely would have been three fatalities. The man who owns the bus spent a year or two searching for the right bus and then many months and many dollars converting it to a motor home. The accident happened on their first big trip if I understand correctly. May God help them and help the family of the young man that crossed the center line. You know they are all dealing with unthinkable heartbreak. This is why we ask you to pray for us on a regular basis. Some one moving four feet out of position at 60 MPH would change our lives forever and possibly end lives. We do not like to think of it, but the picture above and the truth that goes with it, forces us to examine the reality of the possibilities. We do our best to drive safe, smart and keep our equipment in top shape. I keep my eyes on the road and drive at reasonable speeds and probably overcompensate toward safety in traffic, bad weather and erratic acting drivers. However, some things can not be avoided. The bus above is proof that some things can not be avoided. We have had two or three near misses on the road in only the last two weeks. We do absolutely everything we can but prayer is our traveling safety net! We depend on God to help in all aspects and especially areas that we can not help ourselves. Thank you again for praying. God hears and we appreciate it! Thank you, our dear friend! We sure appreciate you praying for us. May God bless you for it.